I find rain to be exhilarating. I associate it with splashing in puddles wearing brightly colored rain boots and the whimsy of spring flowers. It can be a trickster, catching you unawares without an umbrella, so that you arrive drenched like a dog just getting out of the lake. In these moments, it levels the playing field, making even the best coiffed among us into just another human being with wet hair. To my knowledge, although plenty have been reduced to humiliation by rain, no one has ever actually melted from it. I was. The streets were shiny, the lights above were softened, the colors of the flowers popped through the grayness of the day. The rain made a beautiful city even more beautiful. Blurry lights in the night rain of Toronto. Of course, Toronto isn’t all about rain. It is a city that luxuriates in diversity. Even the weather is diverse. What is it they say? If you don’t like the weather in Toronto, just wait 10 minutes. Its motto is “Diversity Our Strength” and everywhere you go there is evidence of all the cultures, peoples, and possibilities that make up Toronto. No wonder I love it there. Two identical condos are for short-term rent by the same trustworthy owners, Troy and Maria Sedgwick, at a high rise building located at 30 Grand Trunk Crescent in Toronto. The condos are fully furnished. They both have two bedrooms, two bathrooms, and great views of Toronto Island and Lake Ontario. I loved listening to the ferry boats coming in and out of the harbor nearby. 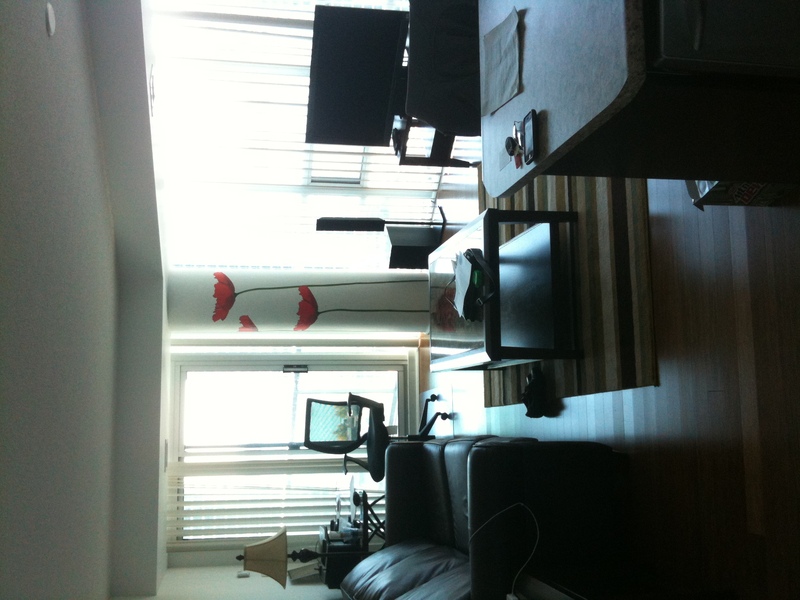 You can also see Rogers Centre, the CN Tower, and Roundhouse Park from the windows and balconies. and, of course, walkability to practically everything we wanted to do in the city. A view of the living area from the kitchen right after we got there. The whole place is less than 1000 square feet, but it feels bigger. 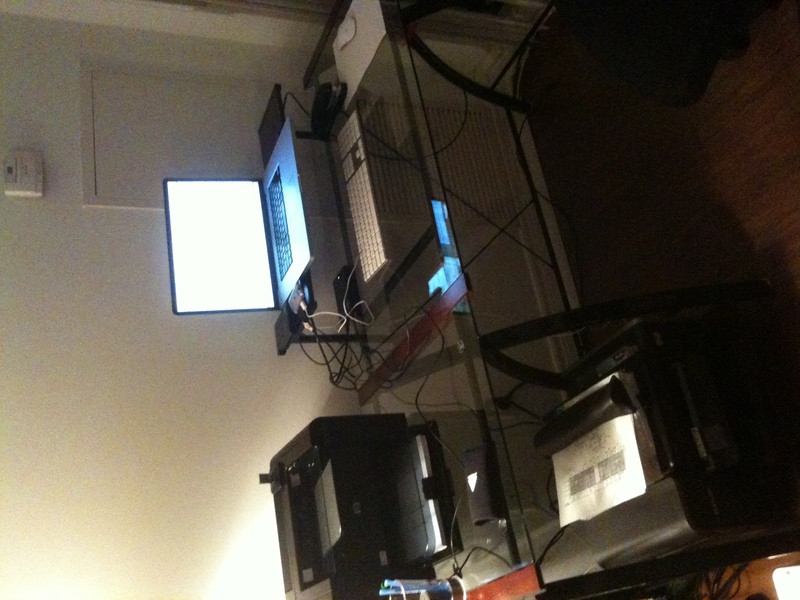 Hubby’s workstation set up and ready for business. The kitchen seemed well-equipped. I say “seemed” only because we really did not use it for much other than storing the food we bought. We never actually cooked there. It even comes with a Keurig coffee maker and supplies, but we ended up going out for coffee a couple of times a day. One surprise bonus was that, just leaving the condo and walking to the elevator gave us about 100 steps each time. It adds up if you do it enough! All step and mileage calculations listed below are based from the front door of the building to a particular location. Longo’s: This higher-end grocery store had everything we needed for our stay in Toronto, including a Starbucks for a quick morning coffee run. Convenience Store: At the street level of the building was a small convenience store where I bought an umbrella and we picked up soft drinks and juice. Because it is in the same building, it is hard to give the mileage, but I believe it was about 100 steps one way. Starbucks: If we had had more time, we would have explored the quirky coffee places I have read about in Toronto. As it was, we got a little lazy and stuck with the Starbucks that was in Longo’s, which was the closest coffee we could find in the zombie-like state that is early morning. Balzac’s: First of all, how can you see the name of the place and not at least secretly smile like an adolescent boy? I fell in love with it in Stratford, Ontario, which I have written about in another blog and will be writing about again very soon! I did not make it to the Toronto version in the Distillery District at 55 Mill Street in Building 60. It is definitely high up on the list of “must-dos” for next time. Tequila Bookworm Cafe and Books: Located at 512 Queen Street West, this little cafe came to my attention after returning from Toronto. Enterprise Rental Car: We rented a car to drive out to Stratford, Ontario for the Stratford Shakespeare Festival. It was easy to return from the condo building because it was less than a quarter of a mile away at 200 Front Street West in Simcoe Place. Scaramouche: In our nearly three weeks in Ontario, Scaramouche was a stand-out above all others. Located at 1 Benvenuto Place, it was our very favorite place to eat. The food was delicious and the service was some of the best we’ve ever had. We learned about Scaramouche through one of those serendipitous moments travelers rely on. We happened to have been seated next to Morden Yolles, one of the partners of Scaramouche, when we were at a different restaurant in Stratford. We were also lucky to see him again when we visited his restaurant in Toronto. On the evening we were to trek to Scaramouche, we encountered another downpour. A quarter of a mile into our walk, Hubby decided we needed a cab, so, after much strategizing during the rush hour rain, we managed to get a taxi to take us to the restaurant. Happily, by the time we finished eating and were full as Australian sheep ticks, as my dad would say, we were able to walk the 3 miles back to the condo, enjoying the different neighborhoods and parks as we went. As a result, this was my favorite evening in Toronto. Volos: This Greek restaurant, located at 133 Richmond Street West, was also a favorite. Not only were we warmly welcomed, we were treated to the bright, bold flavors of a talented chef and staff. We savored the rich earthiness of grilled vegetable orzo and spanakorizo. I had the freshest Horiatiki (Greek) salad I have ever had outside of Greece. It had olives that practically burst with juiciness and feta that melted on my tongue. To top it all off, they had an espresso that had a pleasingly smooth aroma and flavor. For more about our experience at this restaurant, please visit another article I wrote about Volos. 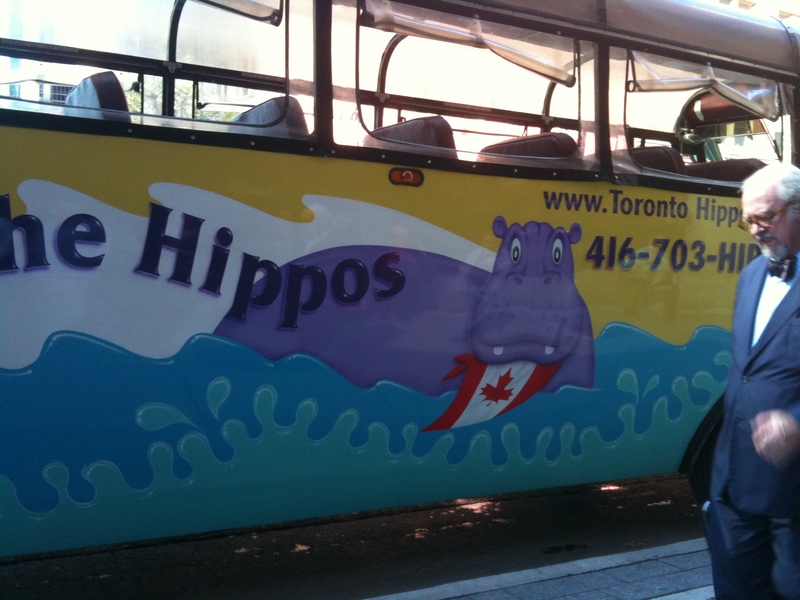 Hippo Tours: I took the 90-minute city tour with this company, but I have learned they are not operating in Toronto anymore. If you’re in Vancouver, though, you might want to check them out! How can you see a bus with a purple hippo painted on the side and not want to ride it? 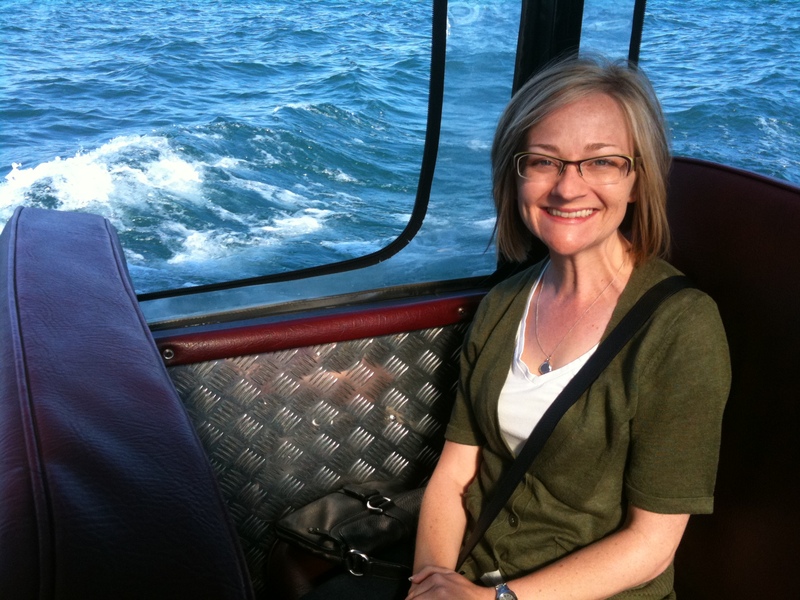 Me on the Hippo Bus, tooling around Lake Ontario. See the waves out the window? 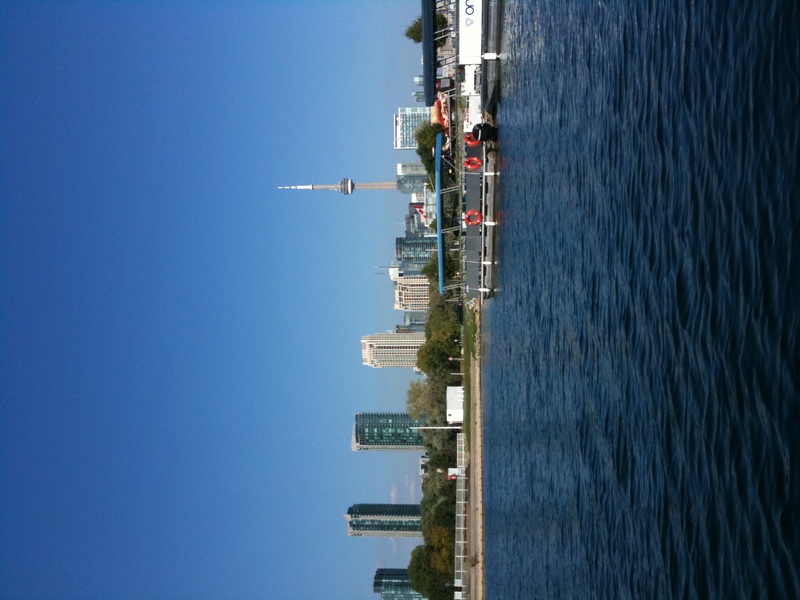 A beautiful view of the city from the Hippo Bus/Boat in Lake Ontario. See? The rain cleared up! It was a gorgeous day! Toronto Tours: The Hop On Hop Off City Tour appealed to me because I could customize the tour to what I wanted to see and do, or, I could sit on the bus for 2 hours and catch it all at once. Rates for adults start right at $40US. Children are $20US. This tour picks up from a variety of locations. I chose the pick-up location closest to where we were staying. Toronto Eaton Centre: I am not a mall or shopping kind of person, but I know others make a sport out of it. So, if you’re jonesin’ for some shoppin’, Toronto Eaton Centre will set your cravings at ease. While we were in Toronto, we made the trek to Eaton Centre because it was where the Apple store was and Hubby needed something from there. They have arranged the mall such that, the higher floor you go, the higher the price tags. I thought that was pretty clever. Roundhouse Park, Rogers Centre, CN Tower: All three of these landmarks are just across the street from the condo building. The whole area was sort of magical to walk around at night with the way it was lit. Next time Hubby and I are going to stop into the Steamwhistle brewery located in Roundhouse Park for a tour. 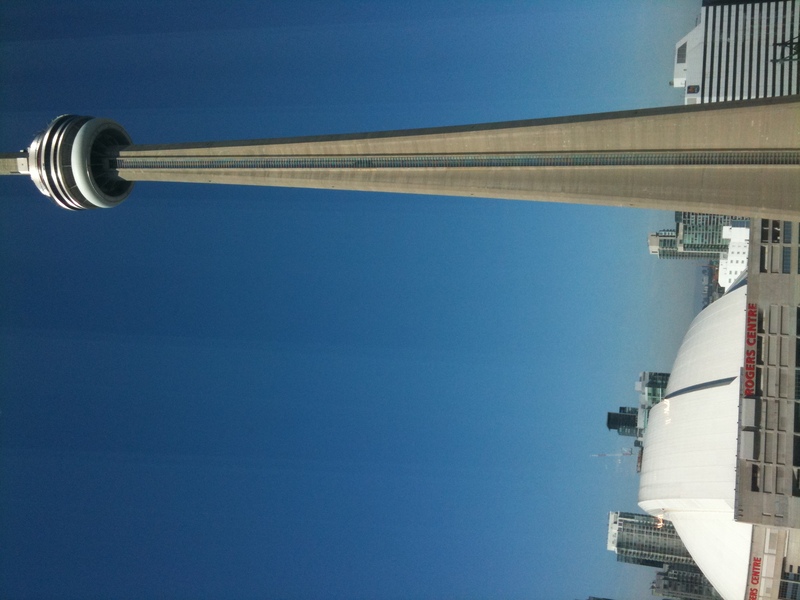 The CN Tower and Rogers Centre. 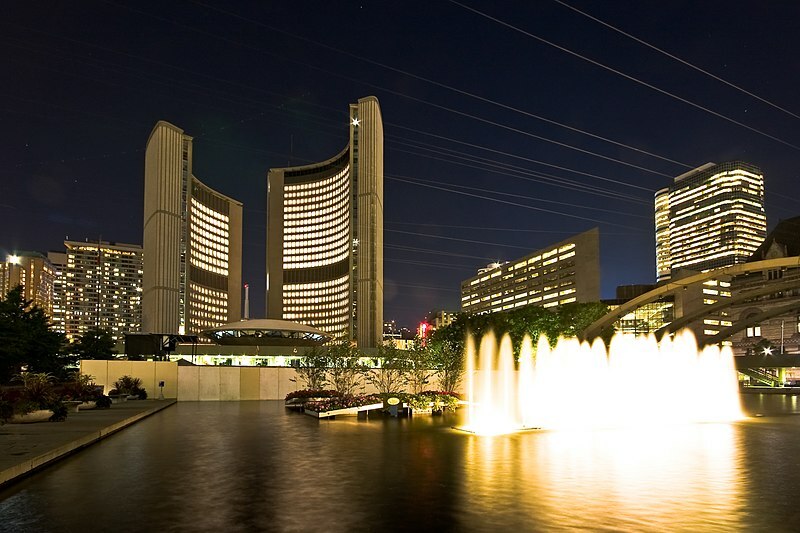 Nathan Phillips Square houses the modernist Toronto City Hall on one of its corners. We watched a moving memorial in this square, dedicated to those whose lives were lost and those who gave themselves in service during 9-11 in New York. It seemed always bustling with activity and is a great people-watching destination. Bonus: According to the National Geographic Traveler, if you visit Toronto in the winter, you can ice skate on the frozen reflecting pool in the square. How fun is that? Queen’s Park: This is a lovely, lush park that I found to be delightfully quiet in the heart of such a grand city. It borders parts of the University of Toronto and is home to the Ontario Legislative Building. Free guided tours are available through the Legislative Building, if that is of interest. Call 416-325-7500 for more information. Royal Ontario Museum: If I could spend just one day in Toronto and do only one thing, this is where I would go. The mission of the ROM speaks to a passion of mine. It is “to build bridges of understanding and appreciation for the world’s diverse cultures and precious natural environments”. Its exhibits showcase a mixture of natural history and world cultures. Adult tickets are $15CN. For more information on ticket prices, or to buy them online, visit their website. If you go on a Friday between 3pm and 5:30pm, the ticket prices drop significantly. If I was there on a Friday night between April and late-June, I would go to the Friday Night Live events where special guests provide sneak peeks into exhibits and activities. You have to be 19 years or older to get in for those events. The cover charge is $8 for students with ID and $9 for everyone else. Members get in free. Distillery District: The culture of Toronto seems to have been distilled (pun intended) into one place, the Distillery District. There are not just historic breweries housed on these brick-lined streets, there are art galleries, cafes, theaters, restaurants, boutiques, and other facets of culture unique to Toronto. This is where lots of music and art festivals are held. Check the calendar for events happening during your visit to Toronto. One of my favorite things to do is ride a Segway and you can do that here with a Segway Distillery Tour. Prices start at $69 per person and last 60 minutes. There are also shorter tours and walking tours available in the Distillery District. St. Lawrence Market: Go to their website and try not to drool. It’s almost impossible. This market, located at 92-95 Front Street East, was named the Number 1 Food Market in the World by the National Geographic. It seems practically brimming with local vendors selling local wares to locals. Canadian Opera Company: When we visited, the 2011/2012 season had not yet started, but we passed the Four Seasons Centre for the Performing Arts quite often during our walks. It was dripping with gorgeous images of operas to come. The National Ballet of Canada performs in the Four Seasons Centre as well. I’d love to be in town for one of their shows. The Four Seasons Centre is located at 145 Queen Street West. So interesting… makes me want to go to Toronto now! Thank you! And, Definitely! Toronto is a great city. Hi there! Just wanted to say I like your blog and thanks so much for the wonderful airport information. I’m trying to set it up as more of a forum so I don’t want to clog up my responses of “thanks” when people are reading through comments if they want to use them as tools of information. Thanks again! Thank you! I get a lot out of reading your blog as well and really like the idea of it as a forum. It seems to work, as so many people seem interested in contributing. We’ll all learn even more that way. Thanks for setting it up and getting the conversation started! Hi! Very cool to see such a fun Toronto trip. I’m getting ready to go to Vancouver & I’m also looking to rent a condo from Troy & Maria! How were they to deal with? Hi Christine! Thank you! 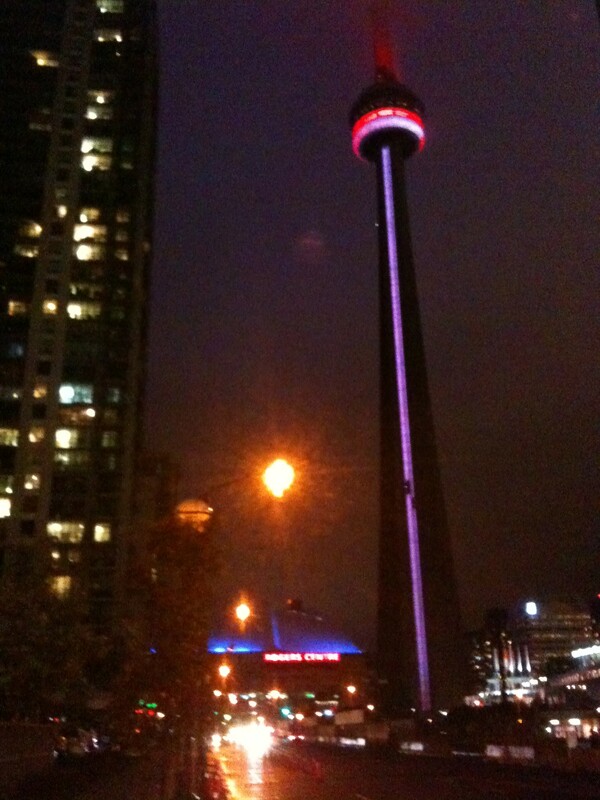 Our Toronto trip was fun, in large part due to the condo we rented from Troy & Maria. Apart from it being centrally located, they were just great to work with. In fact, there was a hiccup on the day we arrived–the previous guests had locked the keys in the condo we were staying in. Troy happened to be in Toronto at the time. He met us there, helped us carry up our luggage, and made sure we were settled before he headed out. Really nice people. Next time we’re in Toronto or Vancouver, I’ll stay in one of their places in a heartbeat. Good to hear! They don’t let you pay through the site(you fill out a form with your CC info), so I was hoping for at least one solid review as a safety! Thanks so much for the response! You’re welcome! Enjoy Vancouver! Bon Voyage!